Hi there crafty friends and good morning. Thank you for joining us in this Holiday blog hop. Inspired By Stamping and WorldWin Papers has teamed up to offer you over 15 inspiring Christmas projects to jump start your holiday season. We hope that you'll find just the right inspiration for your next Christmas themed project. Christmas season is all about gift giving and this hop is no exception. When I start seeing the Christmas decorations being displayed, it puts me into a very festive mood. Just adore the rosette with the Holiday Sentiment, which was I stamped onto Original Colormates®Deep Racy Raspberry and embossed in white embossing powder. I started by stamping unbleached Muslin, with the hexagon stamp for the French Country Background stamp set. Then I ripped the fabric into 2 inch strips and wrapped the styrofoam wreath. I LOVE kraft and the texture of WorldWin Paper is unlike any other kraft cardstock I have ever worked with. It has a really rough texture, which I just love. The Colormates are so rich in color and believe it or not, cuts beautifully using your dies and Silhouette machines. We have planned a very sweet giveaway for a lucky winner. To be eligible for the giveaway, please visit each blog in the list, grabbing the “letter” code as you go. Once you've landed on our last blog, which is the Inspired by Stamping blog, you will leave a comment with the secret phrase created by putting together all of those letters that you collected from each blog. Winners of the giveaway will be announced on October 23rd on both the WorldWin Papers and Inspired by Stamping blogs. The designers have worked hard to produce all of these fantastic creations, and we would like to invite you to leave some comments on their individual blogs as well. What a beautiful wreath! That's really thinking outside the box. This is fabulous wreath! I loved the idea of using hexagon stamp on fabric it looks wonderful ! 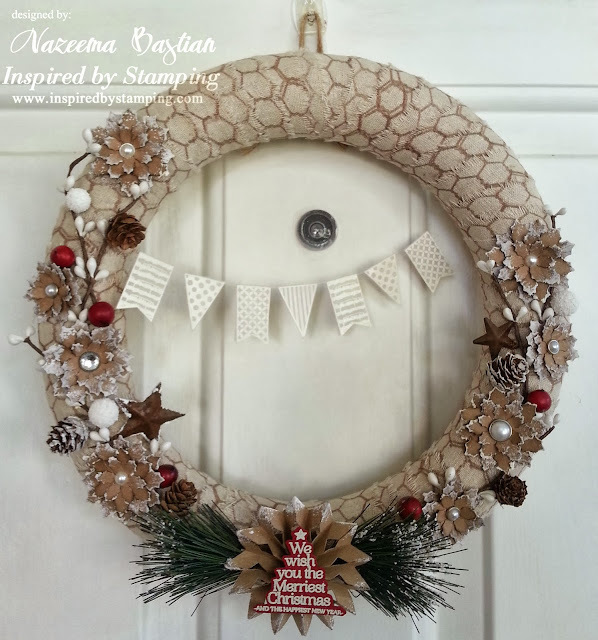 There's no doubt you smiled while making this absolutely stunning wreath! I love all the little details, and that wonderful sentiment, which I know own, teehee! I just am so into the holiday spirit going through this blog hop. I like the different look of your wreath. The kraft flowers with the white edges look wonderful with it. Thanks for sharing a great idea. This wreath is stunning! I love those kraft poinsettias...and the banner is just pure genius. What a treasure! So glad I stopped in for a visit. You do gorgeous work! Hands down my favorite project so far! Awesome! Oh wow! This is stunning!!! I want one! AMAZING!! This is such a gorgeous door ornament -- Beautiful creation!! Oh My!!! Your wreath is incredible....love all the fabulous details. Nazeema where do I start? Your wreath is amazing starting from the stamped muslin to the beautiful flowers and rosette! oh my the wreath is so pretty!! Wow, wow. This is amazing!!! Thank you for the inspiration!!! I LOVE this wreath!! It is so beautiful. And I am so taken with the little banner across it, such a sweet and perfect touch! Gorgeous wreath - love the sparkle. Gorgeous wreath! Love all the 'little' details. Wow, Calypso your wreath is gorgeous. Love the kraft poinsettias and all the embellishments. I love the homespun look! Yea - more home decor ideas!! Oh girlie, I couldn't wait to gobble up all the delicious details of this wonderful work of art. You are a genius to stamp the fabric then tear it into strips, it formed a beautiful base for all the gorgeous embellishments. 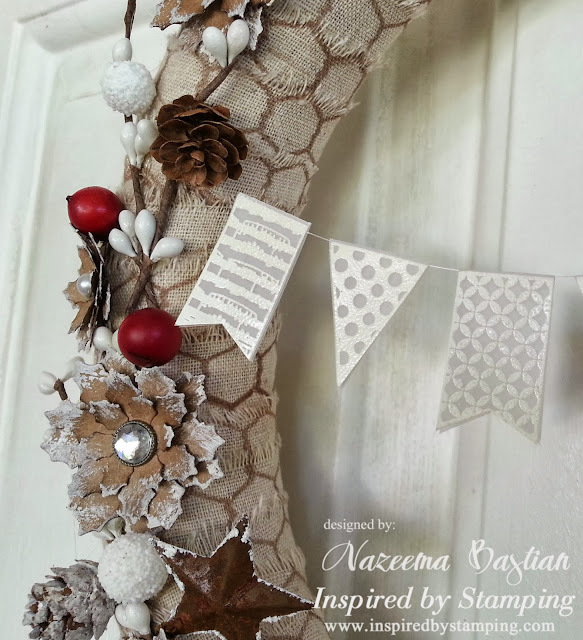 Love the snow-kissed poinsettias and the way you used the WW Vellum for the Whimsical Banners. Love the metal (?) stars and the rest of the fabulous bits and pieces as well. Bravo!! Gasp! My jaw is on the floor! This is spectacular! Such a lovely wreath!! Love all the lovely details!! Calypso...I'm speechless - your Christmas wreath is just beautiful. This wreath is just beautiful. This wreath is stunning! Gorgeous flowers and love all the stamped embellishments! What a beautiful christmas wreath. So much detail, I totally loe it. This is gorgeous. What a beautiful and elegant home decor piece! That is beautiful! All of the details are perfect and look so real. You are so very talented! Gorgeous wreath with beautiful details! Oh WOW! This wreath is totally amazing -I'm loving all of those gorgeous details!